Duval County has the second highest number of babies born to opioid-addicted mothers in the state. Over 170 newborns were diagnosed with neonatal abstinence syndrome, or withdrawal, in 2016 alone. 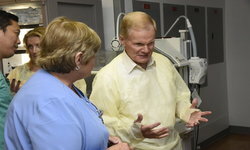 Sen. Bill Nelson and UF Health Jacksonville leaders, physicians and nursing staff met recently for an open discussion about the topic. The aim of Sen. Nelson’s visit was to gather information from medical experts before returning to Washington and continuing in the fight to end the opioid epidemic. “Thank you for all you are doing. I want you all to educate me on what I need to tell the other senators. It has become a pandemic, and it's not just in Florida, it's all over the country,” said Nelson. On the day of the Senator’s visit, three of the 43 babies in the NICU had neonatal abstinence syndrome and were exhibiting withdrawal symptoms. As a safety net hospital, Level III neonatal intensive care unit and regional referral center, UF Health Jacksonville staff provide highly skilled care for the sickest infants in Northeast Florida and Southeast Georgia. The rising rates of addiction reflect in the patients that doctors and nurses see daily. Ginny Murphy, RN, said she used to see about one patient per month in withdrawal. “Now there are two to three every time I come to work, at times up to eight,” she said. “The past statistic was 10 to 11 affected babies per 1,000 live births. Now it is 15 to 16 per 1,000,” said Mark L. Hudak, MD, chair of pediatrics. Most mothers with an addiction begin taking methadone, the most common treatment for drug addiction, once they learn they are pregnant. Other than withdrawal symptoms, the treatment is easier on infants than illegal substances. Children born to mothers taking drugs or in treatment are observed in the NICU for five to seven days for withdrawal symptoms. If symptoms appear, the length of stay varies from 16 days to four weeks as doctors slowly wean the baby off the substances. Common symptoms include a distinct, high-pitched cry, shaking, vomiting, diarrhea and poor feeding. After discharge, the babies are at higher risk for sudden infant death syndrome, as well as domestic abuse and mental health issues throughout their lifetime. They require close monitoring and frequent visits to their doctor. “When babies are discharged to the mother, we encourage follow-up with a pediatrician. We educate the mother here and encourage them to seek further support with a post-discharge program, such as Healthy Start,” Hudak said. At the end of the round-table discussion, Sen. Nelson toured the NICU with physicians and nurses to learn more about the care these babies receive. Issues like federal funding and rising rates of opioid addiction seem challenging, but even despite this, the team of caregivers at UF Health Jacksonville do not waver in their commitment to providing compassionate care to critically ill newborns. For more information, visit UF Health Neonatology – Jacksonville. 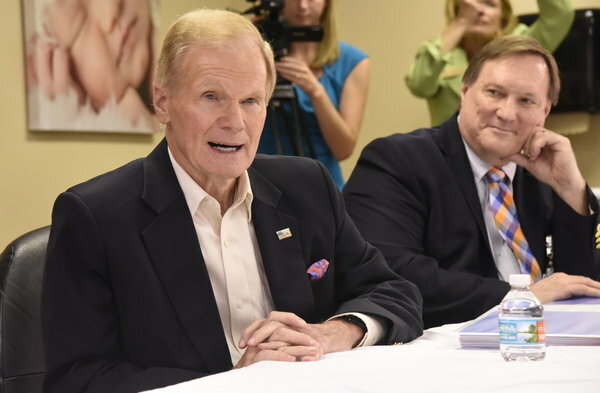 Sen. Bill Nelson, Mark L. Hudak, MD, chair of pediatrics, and other providers discuss how UF Health Jacksonville cares for opioid-addicted infants. Nurse Manager Ellen Gregory, RN, visits the NICU with Sen. Bill Nelson to show him where UF Health Jacksonville nurses provide lifesaving care to newborns.